Germany's World Cup success was a result of the country's professional and financially-sound approach to football. But what about funding other sports in Germany? One startup thinks it's found the answer. When Marthe-Victoria Lorenz talks candidly about Germany's amateur sports scene she struggles to hide her distrust of football. You can tell it doesn't come too easily. "I'm a basketballer and a female one at that," Lorenz says in her Bavarian lilt. "Sometimes I look at the millions that they spend on those football players and have to consciously stop myself from getting envious." "All I want to do is get some new jerseys for my girls team, and 500 euros ($647.50) would be more than enough for that," she adds. The 26-year-old former communications student isn't just a keen basketballer at her club, though. Since 2012 she's been running a company called Fairplaid, an online crowdfunding portal for amateur sports in Germany. Currently, there are two ways of getting financial support for sports in Germany. There are the commercial sponsors and partners, but they tend to invest in clubs and athletes that are likely to get them media exposure. Then, there's the money that comes from the state, including via the German Olympics Sports Confederation (the DOSB). This is only invested in projects that are deemed worthy of support. In contrast, in crowdfunding members of the public pledge money, often via an online portal, to projects that they want to see go ahead. They are then normally promised something in return, by those who have been sponsored. The method, which has existed in the US for years, is slowly starting to become more popular in Europe, and independent films and music as well as community projects are benefiting. With Fairplaid, the benefactors receive vouchers for taxi services or other consumer products for donating money to a sports project. Those donating get something they can use, the companies involved get exposure and new customers and the sports clubs get the money. It's a "win-win" according to Lorenz. The Fairplaid portal includes sports as diverse as women's volleyball, kids rugby and even Germany's underwater hockey team. No cause is too big or small, no project too obscure. The reason it's all necessary, of course, is because most sports in Germany clearly have to play second-fiddle to the country's main pastime, football. The situation is likely to become more pronounced after the country's well-publicized World Cup win this summer. In fact, for years, the country's top football stars have been everywhere you look in Germany's shops or television commercials. If it's not Manuel Neuer advertizing Nutella, it's Thomas Müller talking about his new favorite brand of sausages. Try to find an advert on television featuring the country's award-winning horseriders or hockey teams though, and you'll spend a long time searching. "A lot of companies think that if they get on board early, they may be able to hitch a ride on a football team that gets to the Bundesliga," Lorenz adds. "The fact is, you need to have five million euros to spare if you want to sponsor a Bundesliga club." The latest company attempting to ride the wave of football's popularity is Red Bull. Their financial support of the previously struggling club RB Leipzig, has arguably less to do with developing grassroots football in Germany, and more to do with publicity for Red Bull. "There are two sides to every story," said Alfons Hörmann, the President of the DOSB in a recent interview with sports magazine, "Sportjournalist." "The World Cup showed us just how fascinating sport can be. But, obviously, football doesn't make it easy for other sports. We have to work with the sports federations to think up creative solutions." 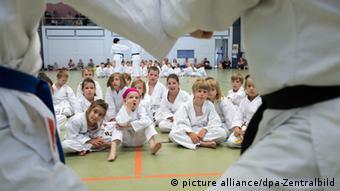 Elite sport in Germany is set to get 140 million euros in funding next year. That's not much when you consider that Bundesliga football clubs over a two month period in the last summer transfer window. But, the German state does do quite a lot to support its sportspeople, especially if you compare it to other countries. The problem is how it is distributed, according to Marthe-Victoria Lorenz. "Most of the money is divided up on the basis of popularity or along the lines of individuals' wishes," she said. And that means football often ends up getting most of the public money as well. Users of the Fairplaid crowdfunding platform know that it has its limits though. Britta Lorenz, team manager of Berlin women's handball team Spreefüxxe, said that she used Fairplaid to raise money for her team's new season in the country's first division this year. "Crowdfunding doesn't quite have the significance yet that it could have amongst Germans," she said. "It maybe needs a bit of time still to catch on." "It's also hard to motivate a diverse city, like Berlin for example, to get behind specific projects," she added. But for German beach volleyball player Chantal Laboureur, the project didn't just raise money, it also helped her secure a new sponsor for next year. "Our sport is growing, but due to the lack of media attention, we do normally struggle to get sponsors easily. This method has made it possible." It's how you use the crowdfunding tool that makes the difference, says Fairplaid founder Marthe-Victoria Lorenz. "I have a dream that we will one day convince big football clubs to help us with crowdfunding, that they will mobilize their huge fan communities to gather financial support for other sports," she says. "It may be just my crazy dream, but you never know. You have to dream big to keep progressing."